By analyzing 200+ real life marketing technology stacks, we finally found the key to navigating the Martech landscape’s 7,040 tools. Marketers can discover where to improve their stack next, to finally capitalize on Martech’s huge potential. When showing the Martech Supergraphic to marketers we often see two reactions. 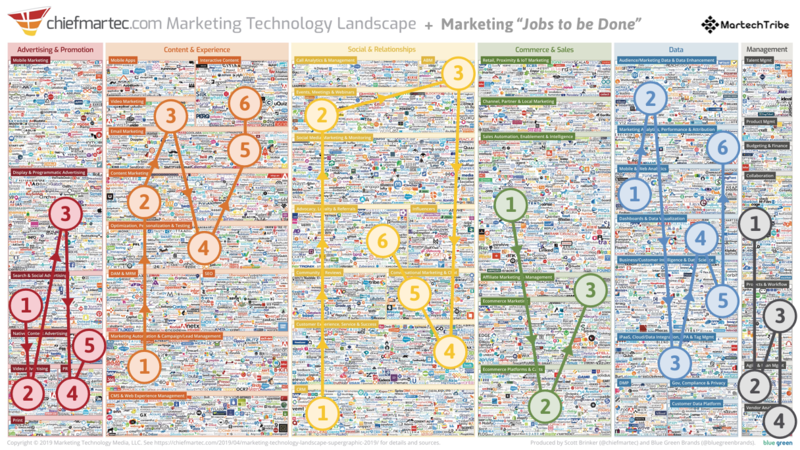 The first one is: “Wow, that’s a lot of Martech tools out there at our disposal. Great!”. The second reaction is: “OMG, this is overwhelming, where do I start?” and then they look dazzled. The Landscape contains 7,040 tools spread out over 6 categories and 70 subcategories, and that’s a lot. What is the logic between the 6 categories, and their subcategories? Do the categories read from top to bottom and left to right? Which types of tools to look into first? What tools are most important? How on earth can you even navigate this landscape of logos? And are other marketers any better at all of this? “To learn where to improve”. Well, research indicates that the skill set of the marketers generally leaves something to be desired, so it’s not just you. As it turns out, 95% of organizations can’t find qualified digital marketing talent. And, 38% are saying that they don’t have the internal skills and talent they need to capitalize on marketing technology investments“. We agree that being in Martech isn’t always easy. For one, it is simply impossible for marketers to check out all the tools in the Supergraphic, if not inhumane. Preposterous. <Add your objections here…>. But luckily, we’ve found a way to slice right through the Martech jungle, to make navigating the Marketing Technology landscape a lot easier. We believe that is the key to unlocking the wealth of Martech potential on the table! Here’s what we did. 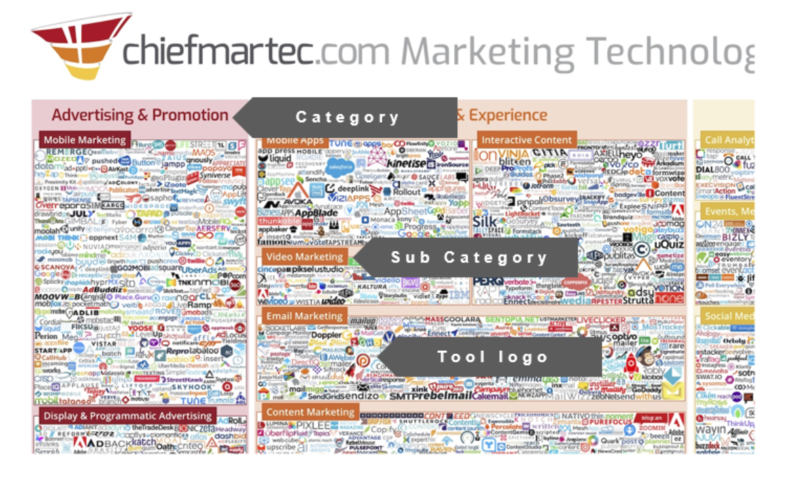 Over the years, we have collected lots of data about tools in Marketing Technology stacks. By matching individual tools to Supergraphic (sub)categories, we can map how tools are divided among these categories and subcategories. That means we know which tools are most popular. If you know which tools other companies are using, you can identify how your company’s stack differs from it – where it overlaps and where gaps are. You’ll quickly get an overview of where, in which (sub)category, your company is well equipped, or not so well. If you’re over-equipped in a certain subcategory, you might be able to cut out some tools and accompanying costs. And if you’re under-equipped in another subcategory, you have just discovered a great opportunity to augment your Martech capability. After some number crunching, one of the first things we stumbled upon was that 120 tools together represent 83% of the total stack mentions. We grouped the top 20 tools in each Supergraphic category and 6 Long Tails emerged. If we look at the % on the left axis we can compare what tools are surfacing more than other tools. In addition, each of the 120 tools in 6 categories also belong to a subcategory? Well, we believe we can use the subcategory names as some sort of marketing task, or at least as a starting point. Subcategory names are coming really close to describing marketing tasks, processes or ‘Job to be done’, if you will. The more popular a subcategory, the more important a marketing ‘Job to be done’ is to a marketing team. 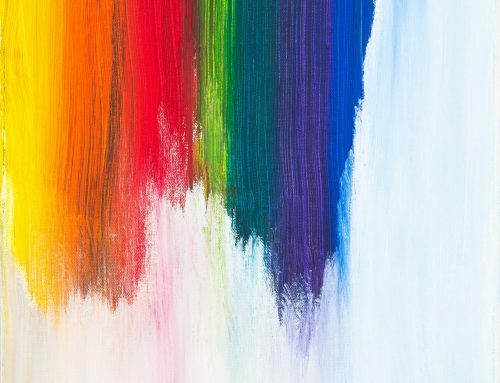 Although it may not be paramount to cover all subcategories for all companies, it’s crucial your company to work with at least some of the tools in the most popular subcategories, to not fall behind the competition. If you are already well stacked in a subcategory, you could remove a superfluous tool from your stack, or go the other route and actually add another tool. Start exploring a less often used tool in that category to possibly generate a nice competitive advantage. This is how the overall marketing practise looks like on a Supergraphic category level. In Ads & Promotion tools are used to get the word out. Basically companies want to make sure their messages stands out in the crowd. The suspects basically say: “I like what you tell”. In Content & Experience marketers intend to generate traffic. Visitors are asking the brand: “Tell me more”. In Social & Relationships we intend to convert those anonymous visitors into known leads. The leads confess: “I like what you sell”. In Commerce & Sales we intend to convert known leads into customers. Prospects or customers are asking the brand: “Sell me (more)”. Data tools tap into the previous 4 categories to collect customer data and consolidate the data into one dashboard and run some intelligence on it. Management tools support marketers with sharing files and internal communication while managing their projects and campaign budgets. If we take a look at the Supergraphic subcategory level then these are the core marketing ‘Jobs to be done’. We even spotted some chronology to how companies expand their stack over time. The chronology is based on how often stacks contain tools from specific subcategories. It’s not exact science, but mighty interesting. For Ads & Promotions marketers first invest in Social Media, then Advertisements, Programmatic Ad Buying, followed by Video Advertising and then PR. For Content & Experience marketers first invest in their web presence, then focus on Search Engine Optimization to better capture & nurture leads. To deepen the engagement they tap into video marketing and testing & optimization. For Social & Relationships marketers start with scheduling Social Media followed by organizing Events, Meetings & Webinars. Customer Experience, Service & Success and Account Based Marketing (ABM) deepen the relationship. Finally MQLs and SQLs are qualified in CRM tools. For Commerce & Sales marketers in B2C mainly use Ecommerce platform. Whereas B2B marketers first invest in Sales Automation, then Sales Intelligence and finally Sales Enablement. In terms of Data, marketers first invest in Mobile & Web Analytics, then integrate the channel data using iPaaS, Cloud/Data Integration, enrich the data with Audience/Marketing Data Enhancement and consolidate it in a Dashboard. Then perform Analytics, Performance & Attribution and Business/Customer Intelligence & Data Science. For Management tools, marketers focus first on collaboration by sharing Files & Documents and to facilitate internal Communication. Agile & Lean Management and Projects & Workflow tools support the smooth collaboration on marketing activities. Curious to know what tools are used most often in the Martech best practise? Read our next blog posts! We will dedicate 6 separate blog posts elaborating on each of these 6 category graphs. The marketers that submitted their stacks have spoken to us. As Martech professionals, it’s our job to discover what they are really saying. If you are interested in which sort of companies’ stacks are in our database, read on. 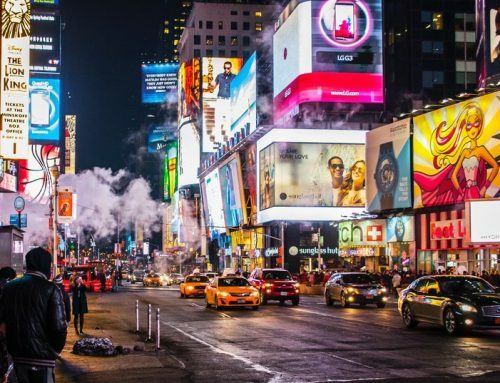 Our martech research gives us a chance to quote the famous Carlsberg beer campaign: “It is probably the most comprehensive free study on the entire Martech landscape to date”. 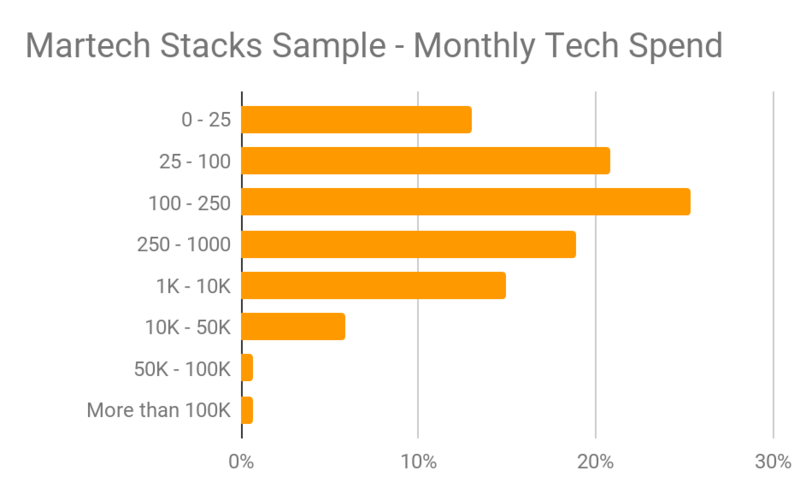 Although our sample is, to our knowledge, the biggest effort undertaken so far to map out the entire Supergraphic, we would be pleased to see the sample of stacks growing. Our current sample consists of 193 stacks, and counting. 1859 unique tools were mentioned 4211 times in these 193 stacks. With those numbers in mind, had a look at the top 20 tools of each of the 6 Martech Supergraphic categories. It turns out that 120 tools were together mentioned 3481 times, that represents 83% of the total mentions. 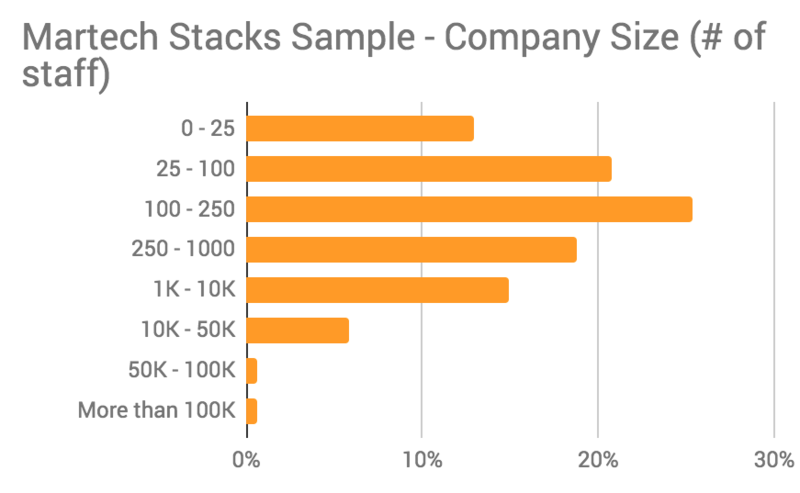 It is very important to know that 85% of the companies in this stack sample are B2B companies. 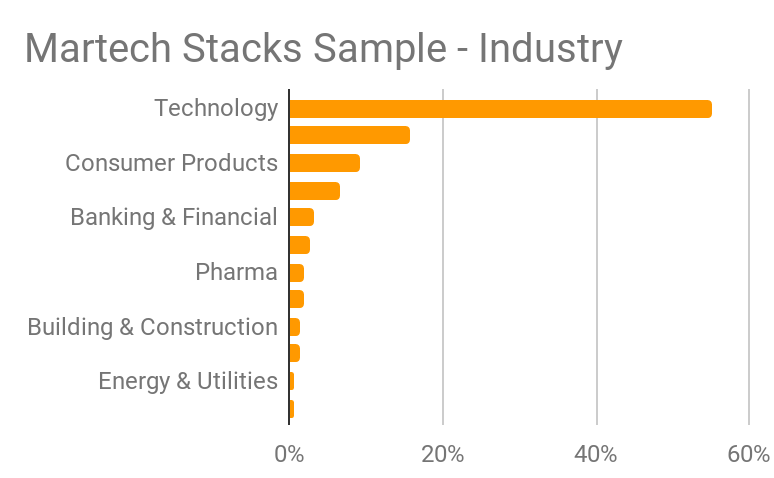 Also, 55% of the companies in this stack sample are Technology Providers themselves. The other 45% cover industries such as Professional Services, Consumer Products, Education and Banking & Financial Services. There are some more interesting characteristics to share on company size, revenue and tech spend. 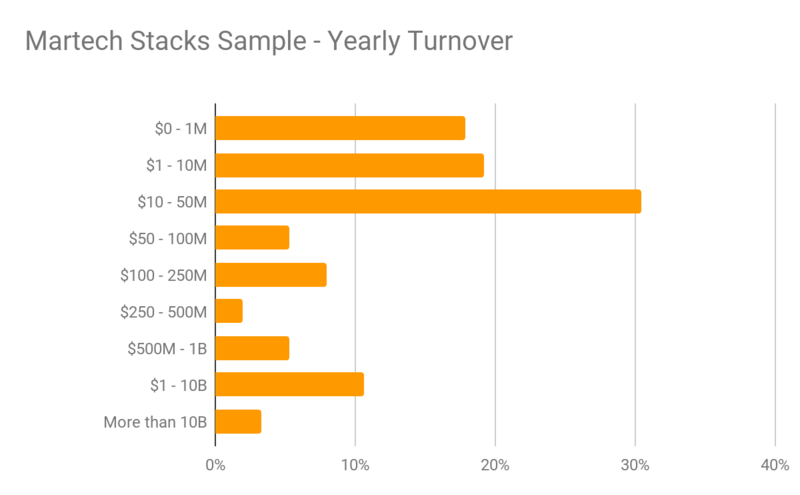 68% of the companies have a yearly turnover between $0 – 50M. We learned that some tools in the Supergraphic surface in different categories. Take Salesforce. It is mentioned in Ads & Promotions, Content & Experience, Social & Relationships and Commerce & Sales. If not explicitly stated as Salesforce Pardot.com or Salesforce Marketing Cloud or Chatter, we allocated the Salesforce mention in the CRM subcategory of Social & Relationships. But the same can be said for Hubspot, Adobe, Oracle, Facebook, Google, etc; they also surfaced in more than one category. We also ran into deprecated or acquired tools like Doubleclick. This tool has been bought by Google in 2013, but people continue to call it by its old name, which is an achievement of sorts, I suppose. If you want to know more about this research, schedule a quick call.